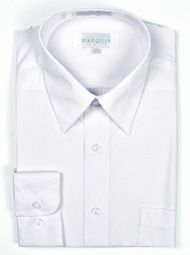 Shop for an all white slim fit dress shirt with total confidence by choosing Marquis. Marquis is a long time leader in providing high quality cheap priced slim fit dress shirts that will please you the moment you unpin the shirt and try it on. This all white slim fit dress shirt features classic long sleeve style with one chest pocket and standard pointed collar. Fabric is wrinkle resistant cotton/poly blend which is easy care. Don't forget to shop our online selection of Slim Fit Suits Here. A slim fit dress shirt features a more fitted torso that is tighter fitting as well as sleeves that lose that billowy fit that standard fit dress shirts have. They are for men who just favor the more tailored look in men's fashions these days when you're in shape and you want everyone to know it as well. If you are not sure how to choose what size shirt you wear, Have someone measure around your neck to see what neck size you wear. We usually recommend going up 1 inch for a comfortable fit and then have them measure your sleeve length from the center of your back to your wrist which will tell you what sleeve length to choose. Once you have those measurements available you will know how to pick the proper size white slim fit dress shirt.